Over the next few months – or longer – I’ll be bringing you interviews with other indie authors or indie publishers. To get the ball rolling, I figured I’d interview myself! Ok, so we can get to know each other a little better, do you have a specific genre that you write in? Absolutely…chick lit…women’s fiction…call it what you will. Do you have a day job? If so, how do you manage or schedule your writing around it? I do. I remotely work back to Sydney. I’m part-time, so 3 days a week I’m on spread-sheets and processes, and the other 2 days (plus whatever time I can grab on a weekend) I have for fiction. I make the absolute most of that time. 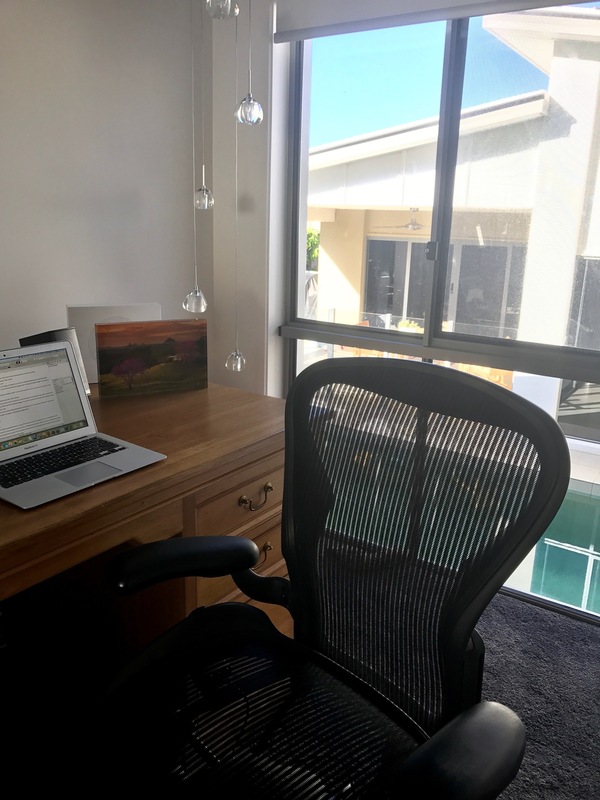 When I lived in Sydney and was working in the city 4 days a week, I’d get up at 5am and write for 45mins before I had to get ready for work – and then again every night. It all feels so much more balanced now. Where do you write? Office, coffee shop, all of the above? 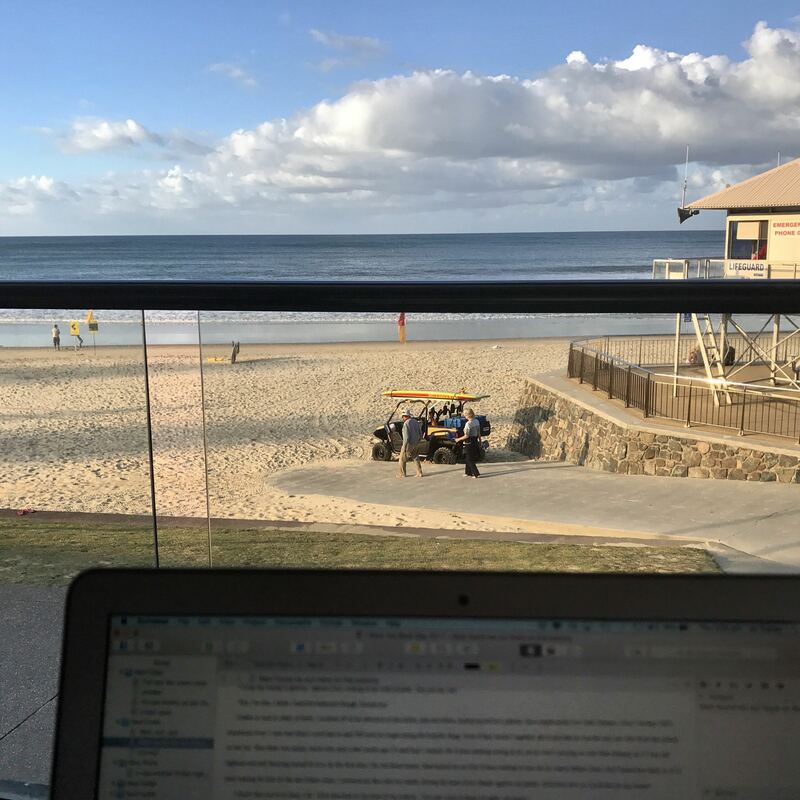 I write in my home office, sitting up in bed (promise you won’t tell my chiropractor), and also down at our local surf club at least one afternoon a week. Why wouldn’t you with this view. What about notes? Are you old school – eg journals or manual notes – or new, ie digital? I’ve written about that before – you can find the post here. Essentially it boils down to creative control. Thinking about recently when I trashed my novel and decided to turn it into 3 novelettes, there’s no way a traditional publisher who had accepted my original pitch would have allowed me to do what I’m doing. My next projects are a huge departure from what I’ve done before too – being an indie gives me the ability to take my career in the direction that I want it to go – for better or for worse. This whole thing has been a huge learning curve, but my biggest takeaway is that indie publishing is absolutely not about overnight success. I thought I knew that, but I’m not sure that I knew it…if you know what I mean. Any regrets? Things you wish that you’d known or would have done differently? No regrets. They don’t work (to quote Robbie Williams). The thing I wish I knew? Just how important an email list and social media platform is. What about your team? Do you use the same team each time? I do. I use Nicola O’Shea for my editorial work, and Keith Stevenson for formatting. You can find them at ebookedit. I also use the same cover designer – Jacinda May. Your desk – messy or neat? Care to share a photo? Coffee or tea…or something else? Music? Or do you prefer to work in silence? I create playlists – or mixed tapes – for each project I work on. This really helps with re-writes. When I’m writing, though, I pop my headphones on and play anything from the classics to indie songwriters. The I Want You Back trilogy. I’m about to start the re-write and can’t wait to get stuck back into it. Great interview and interviewee 😉 I liked reading about your writing process and i love your little Spaniel! 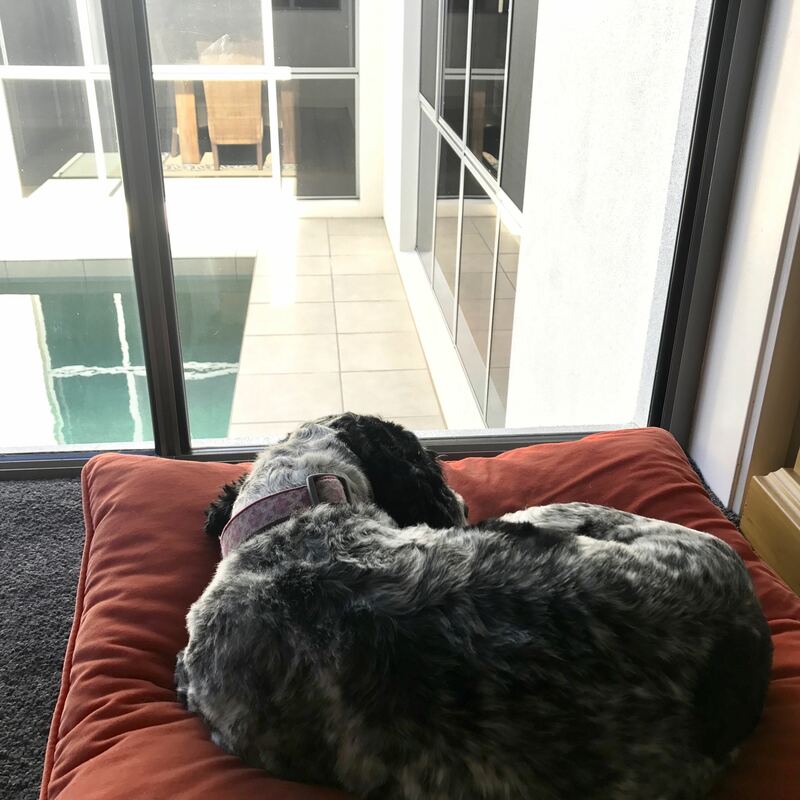 My 11 year old cocker spaniel is also my writing companion. They are just the best company – & never argue or complain abut how loud the music is. Joanne Tracey kicks off her indie author interview series. Her first guest is…Joanne Tracey. Thanks for sharing…& for dropping by. Sensational interview. What are the odds that the interviewer and the interviewee would have the same exact same name? Amazing. Also an amazing concept … I wish I had thought of it. Loved it! Sounds like a great series of interviews as well. I can’t seem to get into a writing routine. Though I do wonder if that’s meant to be…. that short stints at my desk / blogging is what it’s about for me.